Life has always been in contact and supported by the material and potentialities (spirit) in the universe. There has never been a time in which man was not imposing on God and God imposing on man. During this imposition, man is being conditioned in this discipline to arrive at the knowledge of correctness and unto perfection which are parts of God’s Righteousness. So this is what the Sovereign Lord says: “See, I lay a stone in Zion, a tested stone, a precious cornerstone for a sure foundation; the one who relies on it will never be stricken with panic. JOHN 1:1-2 In the beginning was the Word, and the Word was with God, and the Word was God. He was with God in the beginning. The Word became flesh and made his dwelling among us. We have seen his glory, the glory of the one and only Son, who came from the Father, full of grace and truth. I believe as suspected that the question of whether our Creator exist is moot because the whole universe is here, and expressing perfect order. The thought that the universe and humans came into existence by random events is nonsense, and men only use the denial to escape a superior God because they are trying to become little gods. 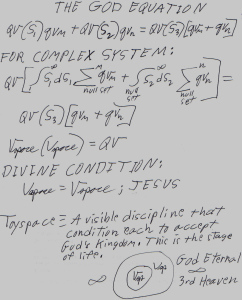 Matthew 16:19 I will give you the keys of the kingdom of heaven; whatever you bind on earth will be bound in heaven, and whatever you loose on earth will be loosed in heaven.” We can assume that there is a Potentiality Who Made all things which is invisible that contain the principles and laws of physics. I define this Potentiality as Uspace, the governor of all things; God’s Righteousness; the stone that God laid in the essense of things (Zion). The above scripture gives the connection between the God’s supernatural spirit of Truth, Uspace, and the NEXUSES of this world which is the physical world in motion. The mind has a brain that stores routine information and a faculty in the upper mind that involuntarily and constantly calculates probabilities from information stored or observed by the senses via the brain. Both brain and upper faculty of the mind function by binding or loosening as dictated by the brain (Free Will). The upper faculty of the mind returns information to enhance the survival and betterment of the subject. Faith (more faith, more accurately hearing God) in the Word of God that furnishes the true binding and true loosening between God’s Kingdom and the world on Earth. Matter and spirit have always been locked together and in a continual wrestling match. This shall continue until the spirit be torn away from the material by God’s Spirit of Truth, His Righteousness which is in His Son, Jesus. Hebrew 1:1-2 [ God’s Final Word: His Son ] In the past God spoke to our ancestors through the prophets at many times and in various ways, but in these last days he has spoken to us by his Son, whom he appointed heir of all things, and through whom also he made the universe. Our main purpose of life is to talk with our Heavenly Father and obey. Life is a process that never stops. Receiving God’s love always without ceasing is the state of mind that all desire, and it is more than sufficient to live a joyful life. Jesus Christ, the Son of God and the Son of Man, is the One that the universe is talking about; discourse with God develops (Religion) through the continual imposition of God and man in our discipline, and can lead unto God’s Holy Spirit that is in Christ Jesus. Due to man being imperfect a Savior is necessary that is perfect and acceptable to God, our Creator. Man acquires his knowledge (QV) such as science and philosophy by the imposition of God (Uspace) and man (Vspace exposure). The heavens declares Jesus (Uspace), Son of God.